Salsette was built in Glasgow in 1858 by Tod & Macgregor at its Meadowside Yard No. 91. For whom the ship was built is unknown, but it is recorded with the Pacific & Orient Company as owners in 1861, the voyage under review (1). 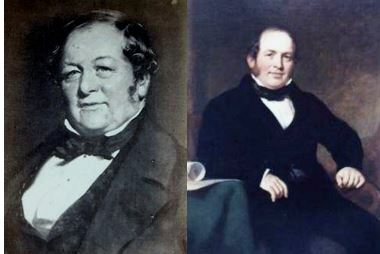 David Tod and John Macgregor founded a partnership in 1833 and were known as ‘the fathers of iron shipbuilding on the Clyde’. From the outset of the partnership they built steamships – over 150 of various types. Their deaths in 1874 led to the shipbuilding company being sold with a subsequent change of name to D and W Henderson and Company (2). Specifications: Official #21578, 1491 gross registered tons (965 nrt) registered in London. A screw schooner liner. Hull of iron; 2-cylinder steam engine; 400 hp; three masts and one funnel; Length: 1293.8 ft. Breadth: 38.5 ft. Depth: 19.5 ft. Draft: 13.3 ft. (3). Captain John M Rogers and his large crew had taken the ship from Port Point de Galle, Ceylon to Sydney, arriving 14th August 1861. 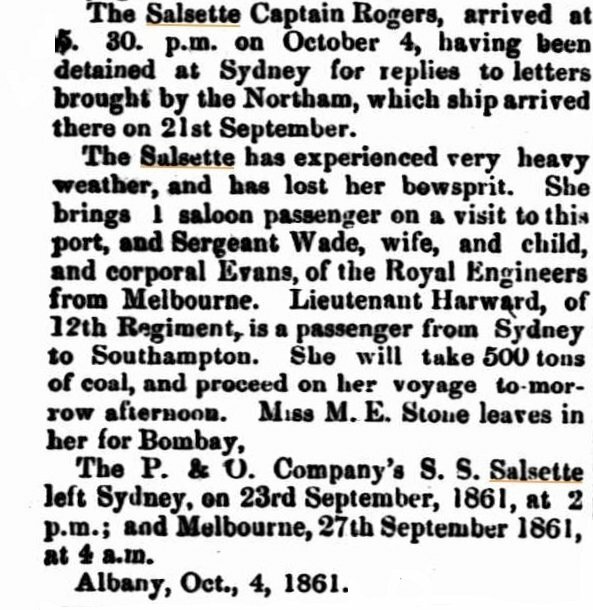 Salsette was detained in Sydney and thereafter commanded by Captain Thomas Rogers; she arrived at Albany on the afternoon of 4th October (4, 5). 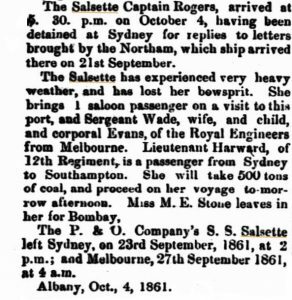 Two Sappers and Miners were on board Salsette: Sergeant John Wade, his wife and child, and Corporal Edward Evans. Each had been with the 4th Company in Melbourne until 26th September after which they were on the Pay List for the 20th Company in Fremantle (6). They embarked on Salsette in Melbourne on 27th September and continued the voyage to Albany. Sergeant Wade was a veteran of the Crimean War and the Indian Mutiny. (1) Caledonian Maritime Research Trust & Crew List Index Project. (2) Wikipedia, and Gregor Macgregor website. (4) Mariners and Ships in Australian Waters website. (5) Inquirer & Commercial News, 16 Oct 1861. (6) Muster Rolls & Pay Lists WO11-199 October to December 1861.